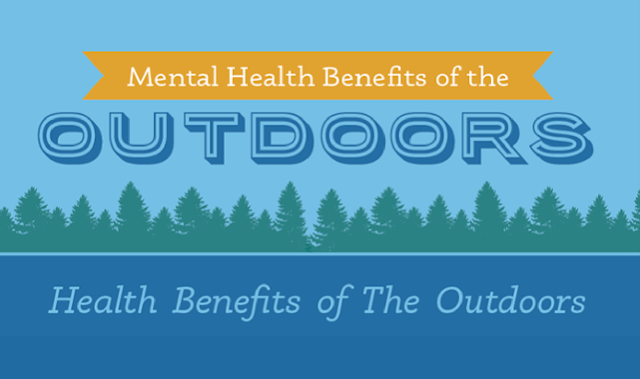 Mental Health Benefits of the Outdoors #infographic ~ Visualistan '+g+"
The mental health benefits of exercise are well documented, known to reduce stress and increase “feel good” hormones like dopamine. But many of us seeking better mind-body heath overlook the benefits found in simply spending time outdoors. It turns out the age-old adage is correct: fresh air is good for you! While outdoor physical activities such as jogging, trail running, and hiking combine both physical exercise and the outdoors for a mental health boost jackpot, according to both the National Institutes of Health and Harvard Medical School, simply spending time in nature in any form can improve your mental outlook, in addition to providing physical benefits. How refreshing!